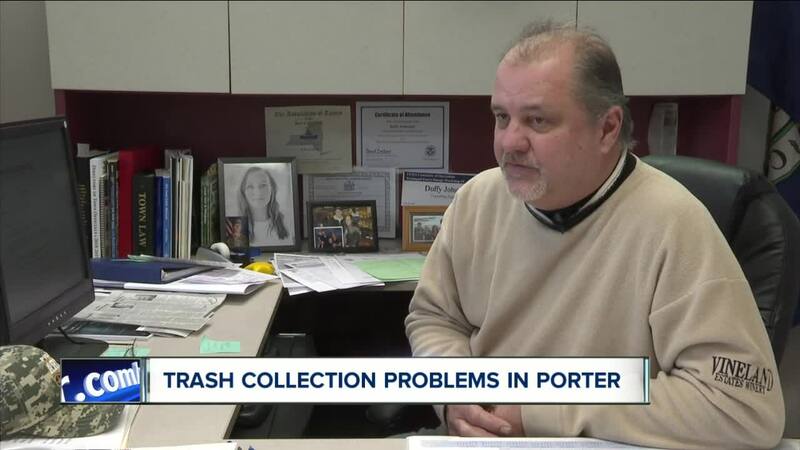 PORTER, N.Y. (WKBW) — The Town of Porter has three weeks of recycling backed up. "We have paper and plastic all over the Town of Porter" Town Supervisor Duffy Johnston said. The trash pickup (done on Thursdays), is done through Lewiston based Modern Disposal. It had to be delayed due to last week's storm. After Modern Disposal decided they could not do a pickup on Friday or Saturday of last week, they decided that the bi-weekly trash pickup would have to occur in Porter during its regular schedule. Skipping the previos week and leaving weeks of trash. "Both my bins are completely packed, my neighbors bins are packed" Andrew Kowalyk said. Both Kowalyk and Johnston made calls to Modern Disposal about the recycling issues. The calls were hung up on by Modern Disposal employees. "It's unheard of that two people got hung up on by a company that has public relations" Johnston said, "That's why we're more upset than anything." In response, Modern Disposal said that were set back by last week's storm so far, they had to essentially start fresh on their routes. The company also says it's looking into the actions of some of its employees. "(We need to be able) to respond better and a little more thoroughly throughout the community on those days" Joe Greer, Director of Sales said. That better response starts with collecting the recycling. Something that have begin to do and will complete for the Town of Porter by Saturday.